A pastor based in Zimbabwe shared this practical testimony about how following Prophet T.B. Joshua’s instruction concerning ‘Water Therapy’ has revolutionised his spiritual life! “I am a pastor and I want to thank God for the recent revelation Prophet T.B. Joshua shared with us concerning ‘Water Therapy’. After I had started, the Lord ministered to my heart to fast and pray for a period. By the special grace of God, I fasted 9 days and 9 nights with this water therapy! Incredibly, I never felt hungry! In fact, I even gained weight in the fast and my strength seems to have increased! The Sunday Service of December 28, 2014 was superlative in every sense. The merry ambience of the Christmas celebrations coupled with the respectable presence of the families of the Martyrs of Faith, all the way from South Africa, gave the occasion all the trappings of Godly joy expressed in a sober reflection. Though they have lost their loved ones, the families of the Martyrs of Faith have keyed into the realisation that their loved ones did not die in vain but were transited to higher glory to enjoy the eternity of life in all its splendour and purity. Indeed, they have freed their spirits and hearts from the inconsequential attachments of this material world and have attuned themselves to that heavenly frequency that avails much to the spirit of man. “Emmanuel! Truly, God is with us! 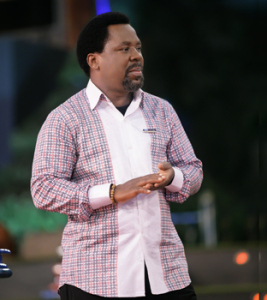 I came to The SCOAN in December 2012 and at the end of my visit, Prophet T.B. Joshua gave me Anointing Water which I returned with to my country, Zimbabwe. From that day forward, every day I prayed and ministered my Anointing Water and carried it with me in my breast pocket wherever I was going. 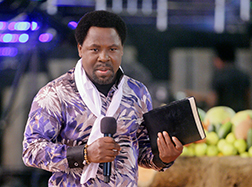 The overcoming presence of God’s glory and the power of the Holy Ghost were unmistakably prevalent on Sunday as, in His infinite mercy, He filled The SCOAN with the anointing that brought healing and deliverance to the sick and afflicted, shattering chains and setting the captives free. The instant the man of God, Prophet T.B. Joshua, spoke the word of authority and commanded satan’s grip to loose, Heavens’ response was spontaneous as people caught the fire, fell under the anointing and vomited poisonous substances to signify the expulsion of darkness for light. Those who worshipped through Emmanuel TV and other various mediums, were as equally convicted by the living and piercing Word of God as those that were physically present at the Arena of Liberty as satan lost his hold on their lives and bowed out. Here is the miraculous testimony of Mr. Nicolas Mohlala who received an incredible healing through praying along with Prophet T.B. Joshua on Emmanuel TV! Indeed, distance is not a barrier to the Holy Spirit! “For those of you who think the age of miracles has passed, you are lost! I have a testimony to share as God has added another year to my life. It is for the glory of God that I give this testimony. For those of you who know about my car accident that happened on 2nd April, you will agree with me on this. “It was a terrible one! When I got to the hospital, my feet were swollen and an x-ray revealed that my two calcareous bones (in the heel) were broken beyond repair. My lateral hub, nose and mouth were severely damaged as well. I couldn’t even breathe properly! RESURRECTION: How Anointing Sticker Restored Life To Dead Baby!!! “Emmanuel! My name is Loritta Obison and i live in Ghana.I want to thank God for what He did for me through the medium of the Anointing Sticker and praying with Prophet T.B Joshua on Emmanuel TV.